Investing in a child pool safety alarm is one of the very best things you can do to ensure that you are keeping your children, and their friends, as safe as possible around your family swimming pool. Below are some tips about installing a pool safety alarm, as well as where to purchase one. Is a Child Pool Safety Alarm Necessary? 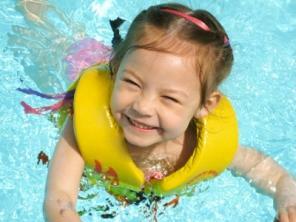 Among children ages four and under, there are approximately four hundred residential swimming pool drowning each year. While this is a scary statistic, there are steps you can take to minimize the risks. Besides installing a pool safety fence, you can also investigate purchasing a child pool safety alarm system. It's weatherproof. Rain or a light spray of water won't trigger the alarm to go off. The Safety Turtle company reports that most children enjoy wearing the wearing the wristband because it looks like a watch. The Turtle is sealed and rugged enough to withstand children's play. In addition to the three to four years battery life, the wristband is portable enough to be taken anywhere, and to any pool. The Gate Alarm system is built on the premise that the weakest link in any pool fence is the gate latch itself. One key feature of the Gate Alarm, along with its seven seconds of sound off even when the gate is opened and then quickly closed, is the fact that it can be used on any gate or door leading to the pool area. Leaving the gate open accidentally is also not an option for this alarm since it will sound off here as well. Conveniently enough, this alarm system comes with an "adult pass" feature that allows adults to go through the gate without triggering an alert and it comes equipped with a UL approved hook up wire, sensor switch and sensor magnet that is specifically designed for gate use. The Door Alarm system does exactly that; it sounds an alarm when any door to the pool opens. This alarm also has an adult pass system that allows them to access the pool without creating a disturbance. Additionally, this system comes with an optional screen door kit (this has to be purchased separately) that allows you to keep your door open for fresh air without tripping the alarm. Pool Guard's In Ground Pool Alarm sits in the pool itself and sounds off whenever an "intruder" enters. Pool Guard claims that its new sensing technology provides less chance of a false alarm due to wind, rain or small objects falling into the pool. Note, however, that once this system is installed in your pool, it cannot be deactivated. When you wish to use your pool, you'll need to remove the alarm from the pool and then switch it into "sleep" mode. This alarm system is similar to the In Ground Pool Alarm, but differs because it sits on top (by snapping onto the rail) of the pool itself. Completely portable and convenient to store, the Above Ground Pool Alarm simply gives you another stay-safe option.